TurboTax is giving up to 10% when you use some (or all) of your federal tax refund to purchase an Amazon Gift Card. Refund amount used to purchase gift card must be in increments of $100. Receive 5% with TurboTax Basic or 10% with TurboTax Deluxe, Premium, and Home & Business. The Amazon TurboTax Bonus Offer is available when you purchase TurboTax Online or CD/download versions directly from Intuit or Amazon.The Amazon.com Refund Bonus Program offers a 5% bonus if you’re using the TurboTax Federal Free Edition or Basic and a 10% bonus if you’re using Deluxe, Premier, or Home & Business. The maximum amount of Amazon Gift Cards that you can get is $10,000. 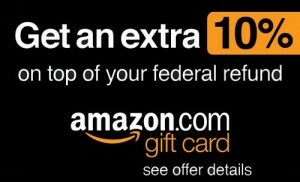 Buy Now to receive up to 10% bonus on top of your Federal Tax Refund when you file with TurboTax and use your Federal Refund to purchase an Amazon.com Gift Card.